are then released/unlocked with the use of specific keys which raise the levers effectively. 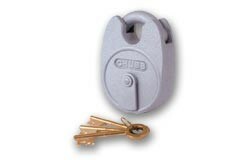 There are 2 heavy duty lever padlocks in this range that are produced by CHUBB - these are called the 'battleship' (£160.90) and the 'cruiser' (£115.07). These two padlocks offer maximum security for heavy duty doors, safes or garages etc. There are also economy options for those with budget restrictions. Manufacturers such as ERA, Fire Brigade and Squire all offer low to medium duty padlocks ranging from the cheapest (£5.92) to the most expensive medium duty lock (£80.12).